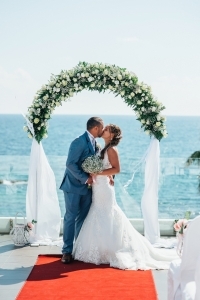 Natalia and Brendan eloped to Cyprus, just the two of them. They had an Anglican ceremony at the quaint chapel of St. Georges chapel on the Beach in Paphos. 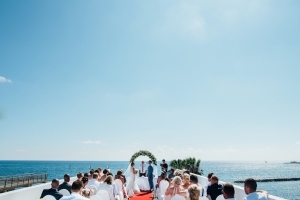 Eloping couples need not just choose to have a civil wedding ceremony. Church weddings are also legal and binding weddings with many different nationalities marrying. Natalia is Russian and Brendan is British. On this occasion myself and one of the church vergers acted as witnesses to this very romantic wedding in October 2018. Always a pleasure to be apart of any wedding; large or small. Intimate elopements are fun for me to organise and no less important that lavish affairs. Church weddings are very meaningful and beautiful ceremonies conducted in English. 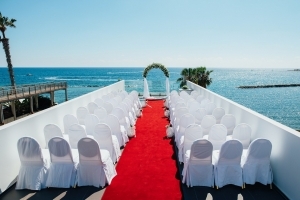 No matter the nationality of the couple we can accommodate your needs and assure your marriage certificate is attested to be recognized in the country of your origin. So happy to call Brendan “husband” “We had a great stress-free elopement wedding organised by Stella. It was a fun and special day – we had great advice on the venue for the ceremony, photographer and food. Stella Virdi was always available to support us“. After being home for 2 months and life getting back to normal we received our photos earlier this week from the photographer. It brought everything flooding back and we just want to say a huge thank you to Stella Virdi for making our day the most special, perfect day of our lives. You were there from day one even helping me choose the venue. You were our Cyprus eyes and we couldn’t have done it so stress free without you. Whatever the question/whatever we wanted you had it sorted. Every guest has said it’s the best wedding they’ve ever been to. The staff at the coral beach hotel were the friendliest, most welcoming staff we’ve met. Tara the wedding coordinator and Christina jones were unbelievable…absolute credits to the hotel. Stella we can’t thank you or rate you enough…2 months married and we couldn’t be happier, we’ll be back one day!! Want to relive it all over again.